Peanut chutney powder or shengadana chutney or groundnut chutney, what ever you call it, it is a very tasty chutney. In other Indian languages, this groundnut or peanut chutney is called shenga chutney (kannada), danyachi chutney (marathi). Like other dry chutney powders you can make it when you have time and serve it when you do not have time to cook any accompaniment for your rice or chapati or with snacks. It is very easy to make and can last for long and is so convenient to use. 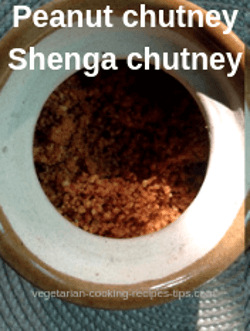 If you have roasted peanuts ready, you can make shenga chutney within 2-3 minutes. You can store peanut chutney at room temperature. No need to store in the fridge. Just see for yourself. These optional ingredients enhance the taste. I do not remove the peanut skin but if you wish, you may skin peanuts. 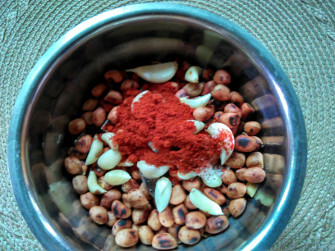 Add the peanuts to your mixer/blender and grind together all the ingredients, chili powder, salt, garlic etc. Grind for a minute. Grind to a coarse powder. Stop blender in between and check the consistency, scrape the sides, mix and grind again if necessary. 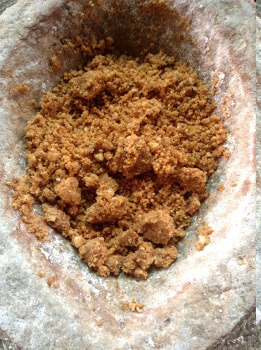 Do not grind it too much if you like to have a little crunchiness in your shenga chutney. Shengadana - peanut chutney is ready. 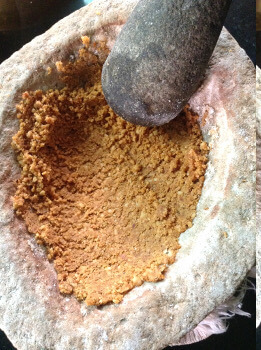 Shengadana chutney may also be pounded using a morter and pestle instead of grinding in a mixer/ blender. That is how traditionally dry chutneys were made in the days before mixer/blender. Any chutney, crushed using a mortar and pestal tastes better, in my opinion. The method of pounding chutney gives better taste and texture as it releases the oil in peanuts, though it needs more time and energy. (You can always think of someone you are angry with, while pounding the chutney. Works very well as a therapy). When you do not have time or energy to pound a chutney, use mixer. This chutney will keep for a month or longer. Make sure that you roast the peanuts properly. You may add some roasted copra along with peanuts. Add some puthane (dalia, gram). 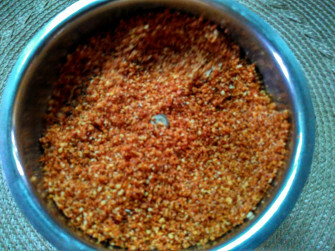 The red color of your chutney will depend on the type and quantity of the red chili powder you use. If you do not have dried curry leaves, roast a few fresh curry leave with or without oil and then use in the chutney. How to use peanut chutney - groundnut chutney - shenga chutney? Groundnut chutney is served with Indian breads such as jowar or bajra bhakri or rotti, chapati, dosa etc. Spread this chutney powder on buttered toast for breakfast or a snack. 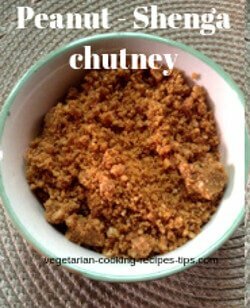 Add a little chutney to plain yogurt to use as a dip. Mix with plain steamed rice and a little ghee. Serve with rice, chapati, bhakri or any kind of paratha. 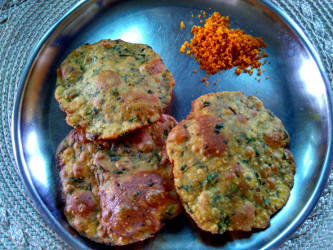 Serve it with vada pav or dhokla or idli and dosa. Just put a pinch of shengadana chutney in your mouth when you feel like it. Shengadana chutney goes very well with methi or palak paratha. Spread a little ghee on a paratha. Sprinkle some shenga chutney on the paratha and make a roll. Kids love to eat parathas like this. Pack these paratha- peanut chutney rolls in the lunch box too. Peanut chutney goes well with methi poori. 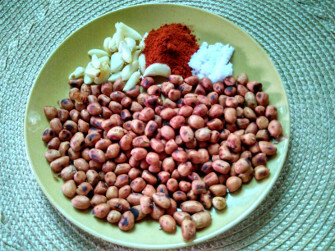 How to roast peanuts - groundnuts - Roasting peanuts on the stove top.